In the business world, appearances and first impressions are everything. Owning a striking, eye-catching outdoor signage is essential. A unique well-designed business sign will create immediate brand awareness on potential customers and partners. Nonetheless, it is important to keep them in great shape and in areas such as Colorado, where weather conditions can be rough and variable, changing from one extreme condition to another, this could become an expensive and extremely complicated task. Heavy storm-prone areas require investing in a tough outdoor sign, built from the best materials. However, high-quality materials, accurate design, effective construction, and proper installation, require professional skills and a considerable investment. If you are a well-established business, this is surely the path to follow. It will definitely pay off, returning fast your investment. For new and small businesses or entrepreneurs, a commercial outdoor banner is your best option. Commercial banners are effective and affordable elements of advertising. They are extremely flexible, as they can be used for indoor, outdoor or mobile purposes. These powerful marketing tools can effectively display your brand and corporate image while creating an immediate response to potential customers no matter where they are placed. A high-quality banner can handle any weather condition when designed properly. 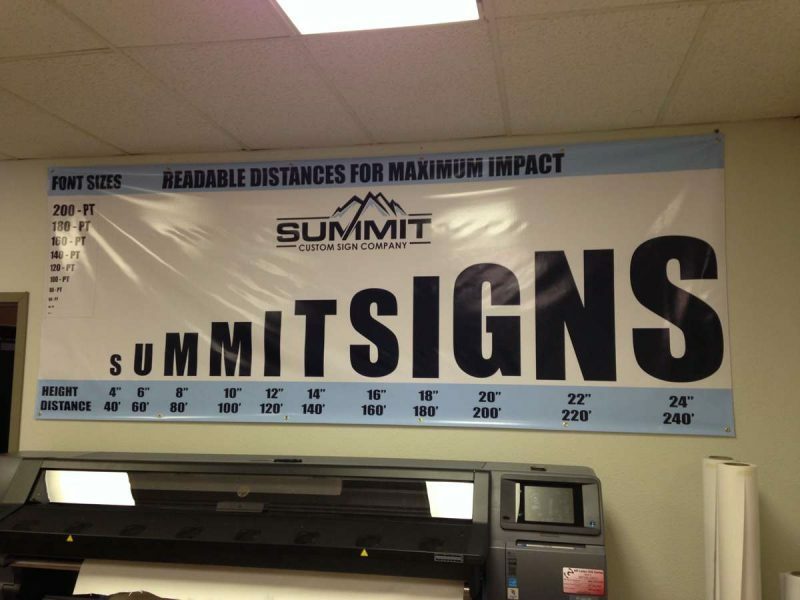 At Summit Signs, our professional signage team will go over your needs and goals, analyzing the location, weather conditions and other elements it will be facing. This way we can come up with the best options keeping in mind your budget. Banners are perfect for indoor and outdoor purposes. Summit Custom Signs quality banners are completely waterproof, resisting any heavy rain without sagging or its colors fading. If you are aware that your banner will be facing a lot of water, our skilled staff will suggest the best options for it to remain colorful and shiny. A strong wind can easily blow any signage away if it is not well constructed or attached. Our commercial banners are well designed to resist even the strongest wind. Before shopping for banners it is better to contact Summit Signs so our professional technicians can visit the area and suggest the best options for your banner. This includes materials, design, finishes, and installation. Some commercial banners are designed with special holes that allows wind to pass through, without damaging the graphics. Depending on the customers’ requirements, banners can be built with hems, grommets, pole pockets, and other different structures to resist the wind and stay attached. The proper design, material selection, and installation will allow your commercial banner to resist any snowfall, heavy rain, or hailstorm. Nonetheless, the beauty of outdoor banners is that they are portable. So, if the weather conditions are going out of control, you can always pick it up and store it until the storm is over. Then just stand it up again. It is important to clean your banner before storing it. Use a mild soap, sponge or mop, and water. Wet the banner with water and gently use your sponge to wipe away any excess dirt. Solvents and harsh chemicals can easily damage your banner so avoid using any cleaner. This way you will prevent any stains on it. Once clean, let it air dry completely before storing or re-hanging your banner. If you have any further questions related to banner design, construction, installation or maintenance, contact Summit Signs today and start branding your business.